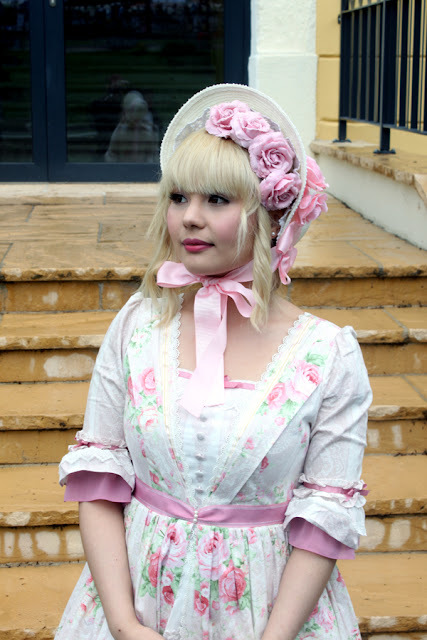 I went to a Biedermeier (early victorian) festival a few weeks ago. 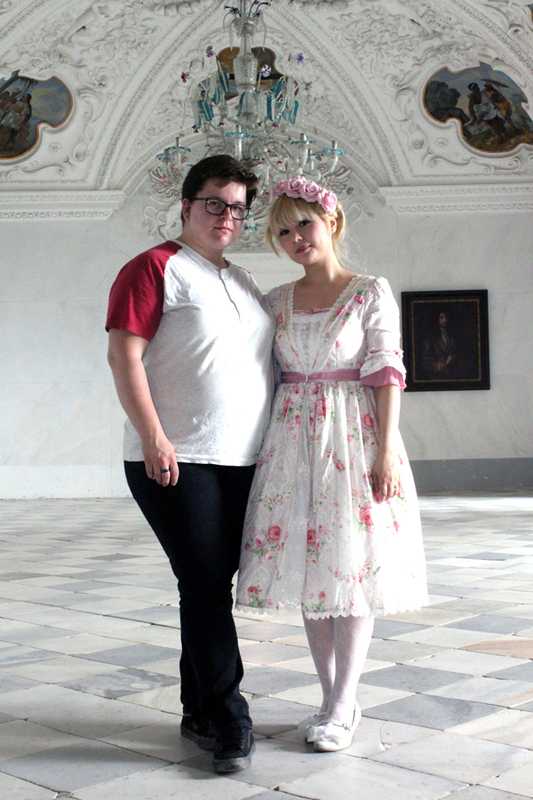 It was held in Bad Gleichenberg, about 1,5h-2h from Vienna by car. The festival was great, there were several marching bands and people in costumes. Although I have to say that even though the costumes looked nice, they were far from historical accurate or even historical inspired. I made it a sport to count zips and nearly every dress had a zip at the back. There was also no one (I saw) who wore a corset? But apart from that and not everyone is as snobbish concerning historical costumes, the people had fun and a great day even though it was raining so hard at times. The grass was so muddy, I was so happy that I didn't finish my dress because it wouldn't have been white anymore. The opening ceremony was a parade of all the people in costumes plus marching bands and soldiers on horses. In the middle of the parade was a coach with "Franz" and "Sisi". Only in Austria. At the end of the parade was a small party village with food stalls and various booths with items to buy. I didn't buy anything but my friends bought soap, a pillow filled with hop, and sweets. Matthias bought me sugared nuts, my favourite. It was just a shame that everything was wet and muddy. My outfit that day, I wanted to do something victorian inspired, was my Yolanda dress with a bonnet. We left the festival after 3-4h because it had started to rain again, or at least looked like it was going to rain again soon. Afterwards we drove to the Riegersburg. I remember it from 10 years ago when my favourite band back then had a video shooting at the castle. It was even in the local news. Yes, I am talking about the japanese band Gazette. And now after more or less 10 years I finally managed to visit the castle. Yey. There were three exhebitions titled, weapons, witches and women. At first I was a bit confused because the castle looked nowhere like in the video. It was more of a medieval stone fortress instead of a nice baroque castle. But we were then surprised in the last room which was the only "nicer" room.